Speaking ahead of the ceremony at the Nokia Theatre in Los Angeles, Dave said it was an emotional encounter. "I didn't tell anybody this but the other night at rehearsal I met (Rush drummer) Neil Peart. I had never met him before and he's such a legendary drummer and he was so nice. "He was offering me coffee and later I went out to dinner and had two shots of tequila and got kind of drunk and I got really emotional. I cried to my wife, I couldn't believe Neil Peart was making me coffee. This whole experience has been so amazing." Canadian rockers Rush were inducted into the Hall of Fame by Dave and Foo Fighters drummer Taylor Hawkins after a career that has spanned more than 40 years. "We've loved the band for a long, long time and now we are the ones that are inducting them. It's amazing. 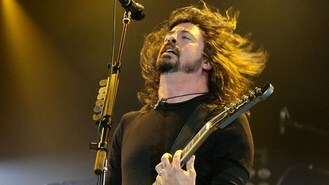 Just to sit down and talk with them for 15 minutes is kind of a life changing experience," the Foo Fighters frontman said. Rush were inducted into the prestigious Hall of Fame alongside rock band Heart, legendary producers Quincy Jones and Lou Adler, hip hop stars Public Enemy and Toy Story composer Randy Newman. Disco diva Donna Summer and blues singer Albert King received posthumous inductions, with Christina Aguilera and Jennifer Hudson paying tribute to Summer.